Program notes are being added regularly. Please check back often! This website indexes program notes that I have written since 1991 for various types of concerts. Audience, size of program, and advance notice given to the author have all influenced their length and complexity. All materials copyright 1991 - 2013 Linda Mack. All rights reserved. Program notes are not only enjoyable and useful for the concert-goer, but are perhaps of even more benefit to the music librarian who writes them. My preparation includes gathering historical and analytical material, studying the scores and listening to the music, aspiring to a deep understanding of the music. After all this research, the challenge is to provide a commentary beneficial and interesting to audiences not only conversant with musical terminology and performance, but those who may have little of this background. In general, I first draw a historical context, then describe the work and call attention to a few important but easily recognizable musical details, adding some human interest along the way. An additional challenge is to do all this in the amount of text that a concert-goer is likely to read either prior to or during the performance. 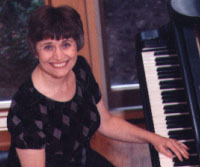 A native of California, Linda Mack grew up in the San Francisco Bay area where she began formal musical instruction at age 6. As a child, not only did she enjoy performing (by age 10 she was active as a church musician and accompanist), but was also a voracious reader of anything in the public library about music. After completing a Master of Music degree in organ performance from Andrews University in Berrien Springs, Michigan, Linda moved to Salt Lake City, Utah, where she expanded her career as a teacher and performer. She also worked for KWHO, a concert music radio station, doing programming and program guide production. In addition, she performed and annotated her own weekly program of organ music, Te Deum Laudamus. In 1987, Linda completed a Master of Library Science degree from Brigham Young University and returned to Michigan to join the Andrews University Library Faculty. From 1993 until 2012 she was Music Librarian, maintained an active performing career primarily as an accompanist and church musician, was keyboardist and program annotator for the Andrews University Orchestra, and director of the Andrews University Early Music Ensemble. Moving to Denver, CO in 2012, Linda is currently organist for Christ Episcopal Church and a free lance writer and musician. While she believes that "writing about music is like dancing about architecture," Linda does enjoy using her musician's ear and librarian's research tools to mine tidbits about music and its creators to share with concert audiences.